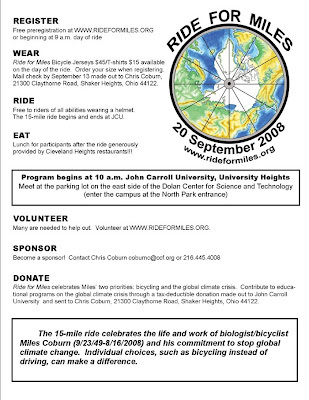 Celebrate the life and support the work of Miles Coburn, an avid bicyclist and environmentalist who was tragically hit and killed by an SUV while riding his bicycle on August 16. The 15-mile ride starts at 10:00 a.m. on Saturday, September 20. Click on the above flyer to view it larger, or click here for more Ride For Miles details, including registration and how to donate.